Electronic musicians looking to move away from the laptop or add hardware instruments to their live performances will at some point consider obtaining a mixer. Whether playing with a rig of multiple synths, drum machines, and samplers, or playing just one or two pieces in addition to your laptop, you'll want to EQ your mix, send signals out to external effects units, and also control various channels' volume from a central hub, amongst other things. While the live sound engineer is responsible for the larger sonic picture, the minutiae of sound is best left to the performer's discretion. But aside from some opinions on select forums, or music gear publication roundups of best mixers available, there aren't a ton of resources for finding the right live electronic mixer. The live electronic musician we are thinking about could be working in any sort of genre. We envision this electronic musician running several pieces of hardware into the mixers covered below, including keyboard and tabletop synthesizers (both analogue and digital), samplers (like the Akai MPCs and Elektron Digitakt), drum machines, and effects. To keep things simple, the following recommendations aren't aimed at Eurorack rig owners. On the other hand, these mixer recommendations could work for electronic musicians who are blending several pieces of hardware with laptop-based virtual instruments, including Ableton Live and Max/MSP, the latter of which is a sound ecosystem completely unto itself. Solo electronic acts and duos just getting into the live game—those whose sound is built on hardware electronic instruments, not traditional instruments like guitars and drums—will probably gain the most from these recommendations. Artists with sounds and approaches like Arca, Laurel Halo, Flying Lotus, and Aphex Twin, working across genres like techno, house, ambient, hip-hop, IDM, experimental, and so on. That said, bands running significant amounts of hardware alongside their traditional instruments might also come away with some useful knowledge. The mixers below are all relatively new products. So if you want more vintage mixer options, that will require some solo research on your part—though hopefully this roundup will prove helpful for vintage sleuthing. And by "budget," we mean mixers that won't break the bank to acquire, whether new or used. Selecting a mixer won't be like acquiring an expensive piece of kit, such a Dave Smith Instruments synthesizer or Waldorf Quantum. Think of it as the hardware equivalent to an inexpensive but vital plugin for your DAW. For the price as well as the sound quality, the Yamaha MG-10 is an attractive option right off the bat. 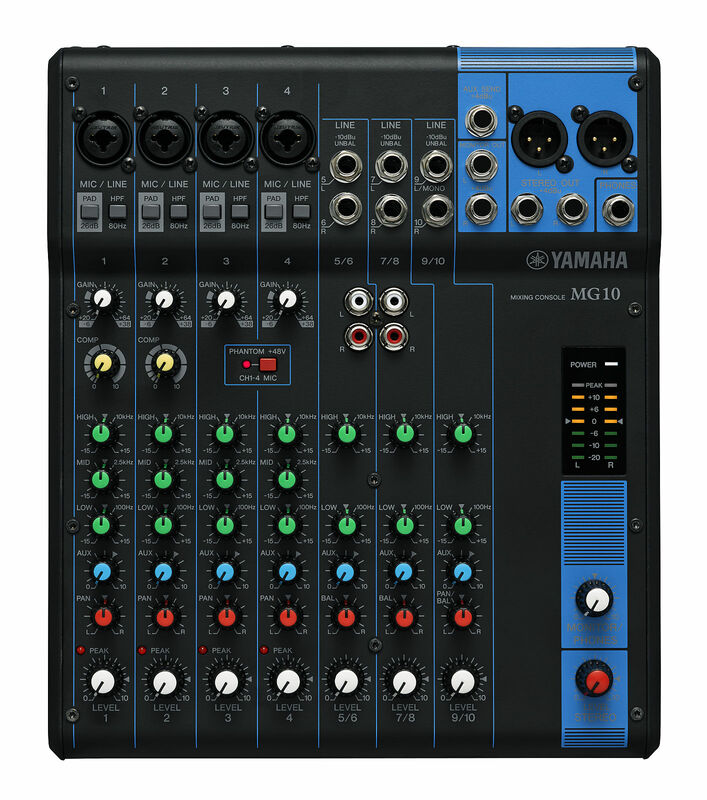 Most people will hear a lot about Allen & Heath and Mackie mixers (more on them below), but the Yamaha MG-10 is in many ways the budget mixer to beat. A 10-channel analogue mixer, it comes equipped with Aux Sends for each of the channels, which allows you to split the signal off to apply external effects to different instruments. Meaning, you can apply a multi-effects processor to a keyboard synthesizer, while applying distortion and delay to a drum machine, or even just to add reverb to vocals. The MG-10 is also attractive to gigging electronic musicians because it has a small, light, and portable chassis. There are onboard EQ, compressors, and studio grade class-A D-PRE preamps, which makes that high-quality sound possible. The only problem for some musicians might be the lack of sliders, and the Aux Send doesn't have dedicated return channels—though you can use three stereo line channels as returns for the external FX unit (if you want to control the final mix before sending it to the sound engineer's board). Note: The MG-10XU, a slight step up from the MG-10, comes with onboard effects and iOS connectivity. There is no way that an Allen & Heath wouldn't appear on this list. They're just that iconic. And they're iconic because Allen & Heath produce some of the best mixers out there, whether for DJs, live sound engineers, or musicians looking to mix their own sound live. Competing in roughly the same space as the MG-10 is Allen & Heath's ZED-10. 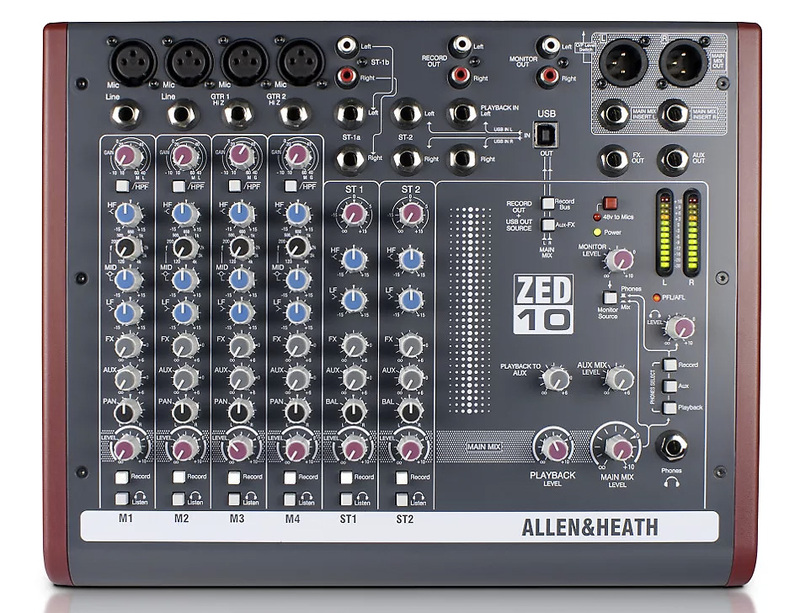 Like the MG-10, the ZED-10 is an 10-channel analogue mixer. Also like the MG-10, it's portable and comes with a crisp, clean sound thanks to high quality preamps. The ZED-10 also features USB connectivity, which allows users to utilize it like an audio interface for either studio or live recording into a laptop DAW. It's worth mentioning that the ZED-10 chassis is built to endure more punishment than the MG-10 and the 802VLZ4 (more on this one below). So, those electronic musicians who gig frequently, or who put durability—whatever the usage—at a premium, then the ZED-10 might be the best option. One big drawback on the ZED-10 is its inputs. While it comes with four mic and four line inputs, the four occupy the same channel. So, if you use a Mic input on Channel 1, it renders the Line input inoperable. Then again, that would still leave you with the other three Mic/Line inputs, as well as the Stereo inputs, and live electronic musicians probably won't need to exceed this functionality, unless they've got a massive rig—in which case, these budget mixers might not do in the first place. 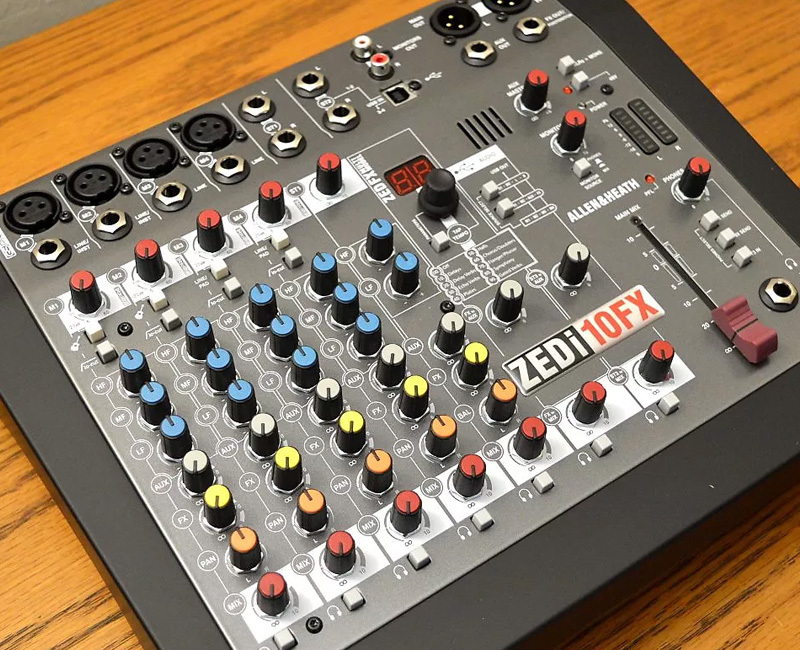 Note: The ZED-10 comes in a few different versions, including the onboard effects-equipped ZED-10FX, the ZEDi-10 Compact USB Mixer, and the ZEDi-10FX Compact. Mackie has long been a manufacturer of popular live and studio mixers. With the 802VLZ4, they designed an extremely portably and high-quality sounding 8-channel mixer. Alongside the MG-10 and ZED-10, the 802VLZ4 is undoubtedly one of the top choices for the gigging electronic musician. The 802VLZ4 comes with three XLR Mic inputs, two 1/4" mono inputs (Channels 1 and 2), six 1/4" stereo inputs (Channels 3/4, 5/6, and 7/8), as well as two RCA inputs. Like the MG-10 and ZED-10, the 802VLZ4 comes with phantom power for the Mic preamps, and Aux Sends, but also a true stereo Aux Return for external effects units. As hinted at above when speaking of the ZED-10, the 802VLZ4's construction isn't the greatest. The form factor is smaller for one, with smaller knobs and less surface area to navigate. But it probably won't stand up to constant live gigging the same way that the ZED-10 or even the MG-10 will. 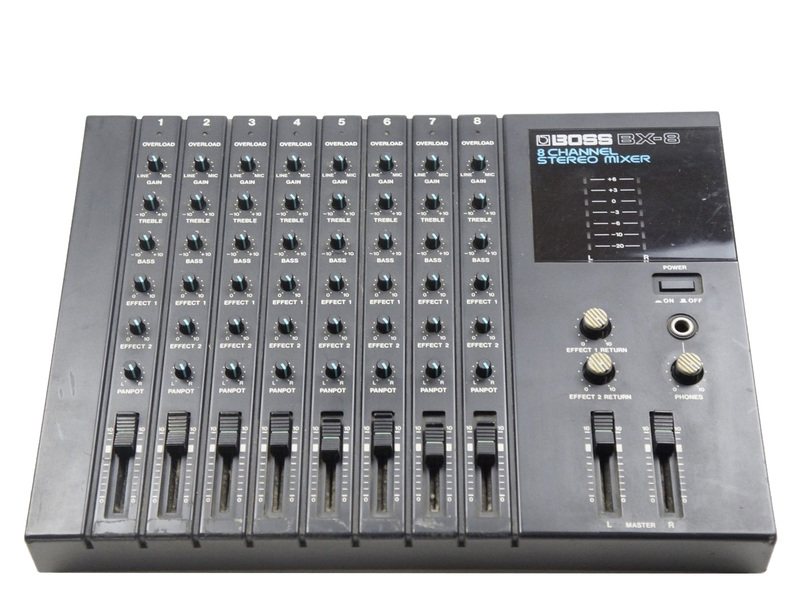 Like the 802VLZ4, the Soundcraft EPM8 is an 8-channel mixer. It's a bit more expensive than the other mixers, and it shows. 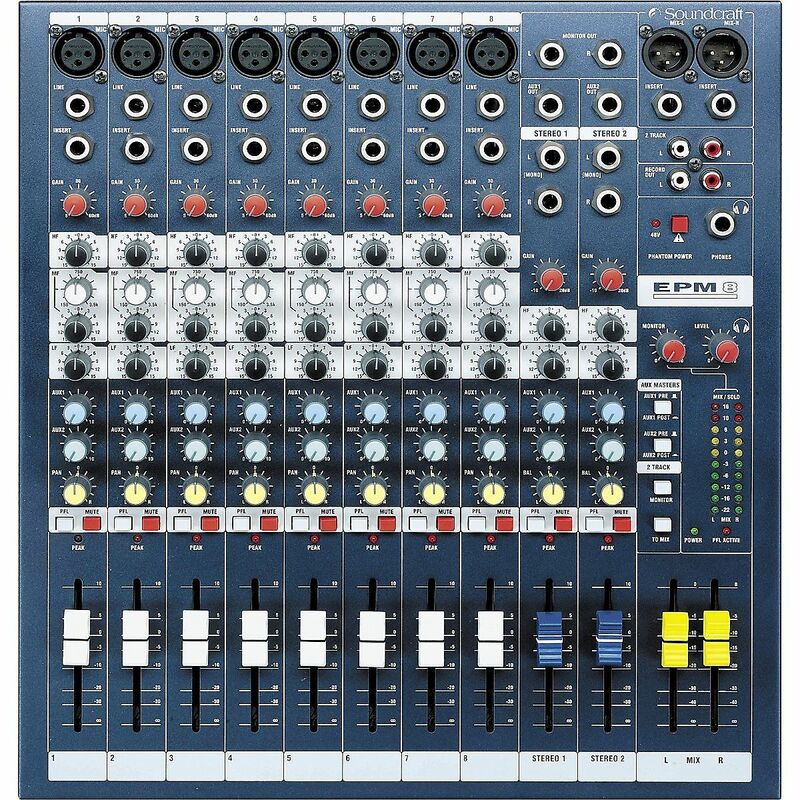 The EPM8 comes with eight Mic/Line inputs, two stereo inputs, and two Auxiliary buses (compared to the other mixers' one). Beyond these features, the eight Mic/Line inputs come with four-band EQs, while the two stereo inputs are two-band (high pass and low pass). And each channel is equipped with a Gain knob. A major upside on the EPM8 is that each of its channels has a dedicated slider for level, as well as sliders for the main Mix (Left and Right). Compared to the 802VLZ4, which is a little confusing at first glance, the EPM8 has a clean, no-nonsense layout. 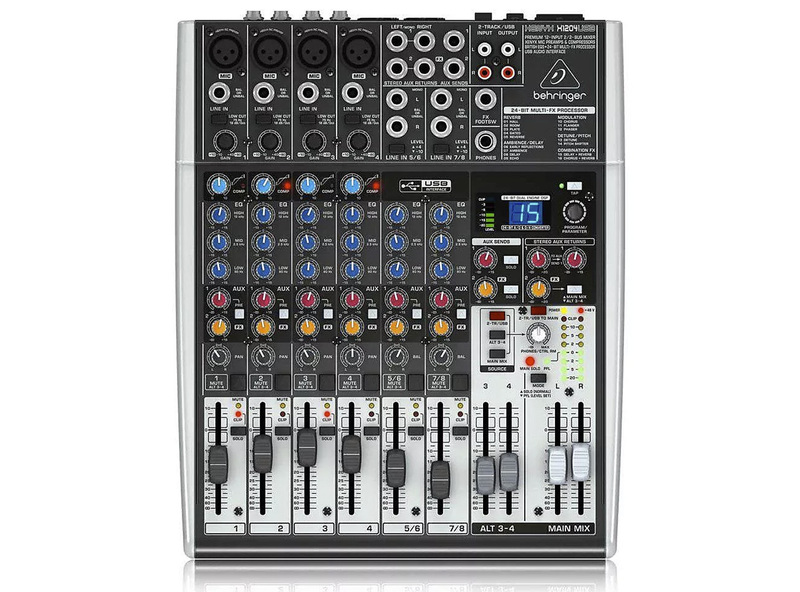 But, again, all of these features mean that the EPM8 is a bit more expensive than the mixers above. Behringer produces budget mixers that might find a home in your live electronic setup. 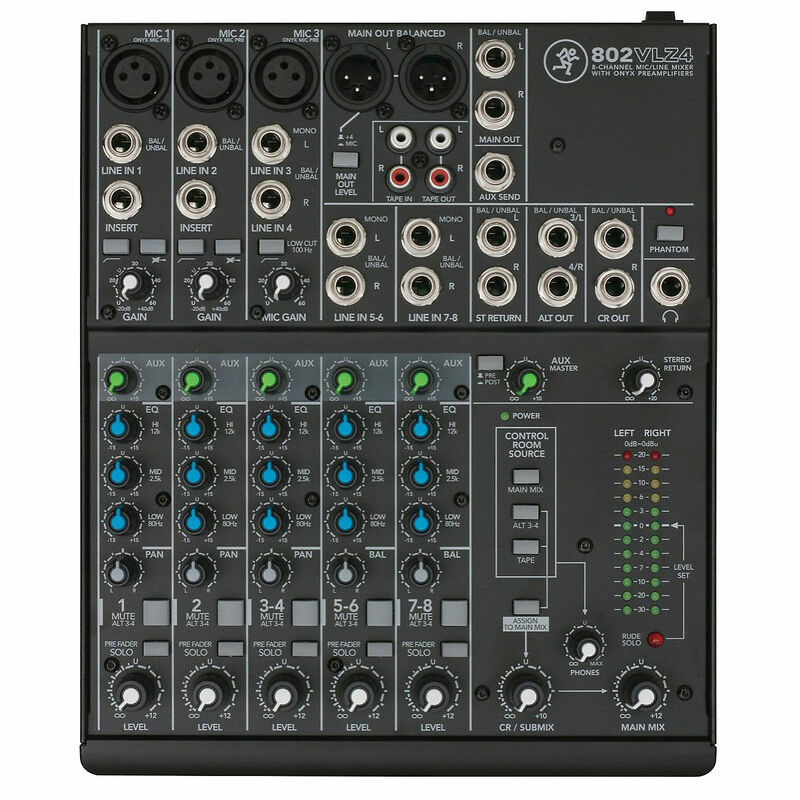 Check out their Xenyx X1204USB 12-Channel analog mixer—it's cheap and will get the job done. Just keep in mind that Behringer isn't exactly known for build quality, so if you plan to gig heavily, maybe opt for a mixer with a more durable chassis. Another option is the Boss BX-8. Yes, we said we weren't going to dive into vintage mixers, but we couldn't resist mentioning the BX-8. It's an 8-channel mixer with a healthy following amongst lo-fi recording artists, as well as those looking for a dirty, warm sound that was typical of 1990s techno. Have a favorite mixer that we've missed? Let us know in the comments.